This project is a mixed use residential building in the downtown area of Redmond that is rapidly redeveloping, between NE 80th St. and NE 81st St. Commercial space and a courtyard on the east side of the building at ground level responds to the adjacent site where Cedar St. is planned to be converted to a woonerf. 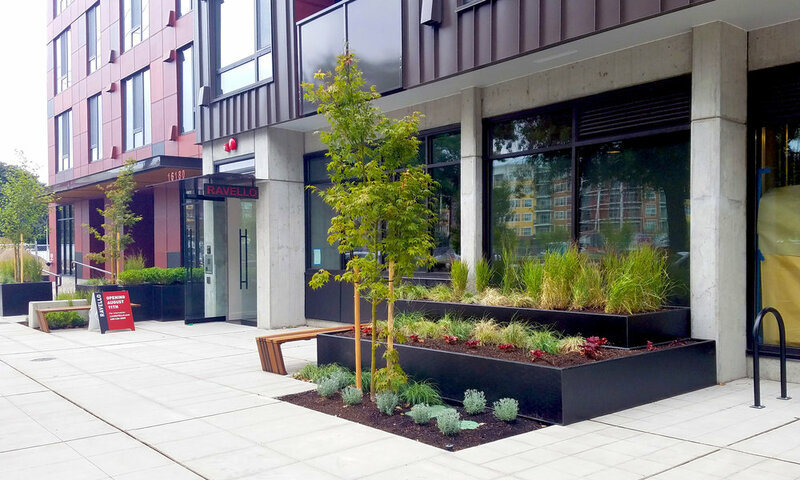 Large custom raised planters and trees help buffer the at grade live/work units. The commercial entry area allows for outdoor seating and opens up on to the woonerf. The courtyard design responds to the design of the woonerf as well, incorporating large raised planting beds, bike racks, and integrated seating and tables. The landscaped area to the west features a variety of trees and shrubs to soften the concrete wall and provide a buffer. The second floor patios have several planters with trees and shrubs, to filter strong afternoon sun, as well as raised planters with bamboo between units to provide privacy. The roofdeck features greenroof, raised planters with shrubs and small trees, a firepit and outdoor seating, and a BBQ area with tables.